Murraya is comprised of a dynamic team of individuals who pride themselves in excellence. We work together harmoniously and with confidence in our abilities and contribution. A multi-lingual practice, we’re able to communicate with our clients in English, German, French, Spanish and Catalan. In our role as oral health care professionals we value our partnerships with people. We endeavor to provide a pleasant and friendly atmosphere in which to dialogue. Through successful communication we reach our ultimate goal of improving and maintaining the oral health of our patients. Dr. Rosh Govindasamy has been practicing dentistry in the Yukon for the past 18 years. She graduated from the University of Toronto in 1991, and is the owner-operator of Murraya Dental Centre. She enjoys forming long term relationships with her patients and providing up to date dental care. Her many hours of continuing education enrich her discussions with patients and help to improve their oral health. Dr. Govindasamy has a strong interest in practicing aesthetic dentistry while providing sound solutions for her patients. Following graduation from the University of Toronto in 1976, Dr. Stern practised in that city for a year before deciding that big city life was not for him. So what better place to move to for small-town life than Fort Nelson B.C. where he stayed for two years. Then, in a classic repeat of the Goldilocks and the Three Bears theme, he found that while Fort Nelson was a bit too small, Whitehorse, up the Alaska Highway in the Yukon, seemed to be about the right size to settle in and raise a family. So he checked it out in 1979 and has been residing here happily ever since. 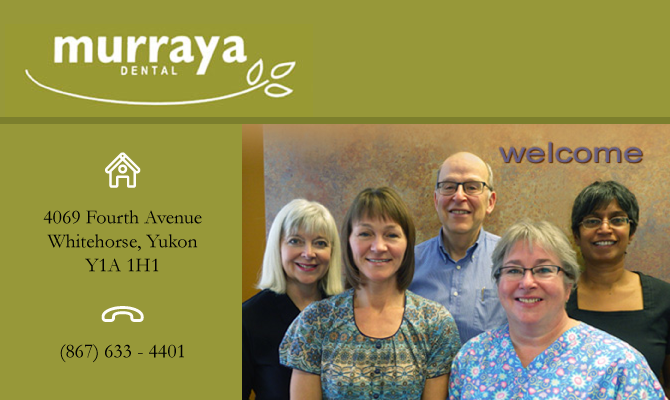 Although a long time dentist in Whitehorse, he is an enthusiastic newcomer to Murraya Dental where he will be practising until retirement. When not in the clinic, Dr. Stern can be found on the mountain bike trails in the summer and the X-country ski trails in the winter.